The Sydney Space Association sent me this flyer promoting my lecture to them - UFOs - the great & secret show. My title borrows from fantasy writer Clive Barker's book title as it resonates strongly with the themes I will be examing - namely the extraordinary scope of the UFO phenomenon and why the UFO reality is largely remote from our mainstream awareness because of marginalisation by media, government and science. I examine the hidden dimensions of this remarkable paradox. 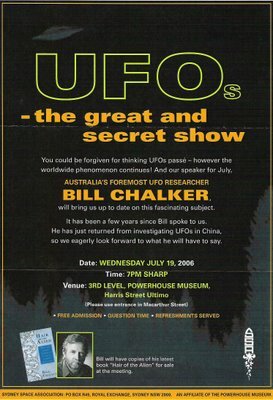 Despite the recent prominence given to matters like the secret British Ministry of Defence "Condign" report (which claimed that UFOs or "UAPs", as they call them, are much ado about "plasmas" and other natural phenomena), the mainstream media's regular proclamations that UFOs are yesterday's "fringe" news, and the sceptical debunking of the subject by so-called scientific "experts" (e.g. the Harvard psychologist Susan Clancy's claim that alien abductions are little more than "sleep paralysis" and various psychological conditions), there is the striking and inevitable paradox that the UFO and alien abduction phenomenon has not gone away and is very real and vitally present. Free admission, question time, refreshments served. "Flying saucers" entered the mainstream in 1947. Initially perceived as an American passing fad newspapers in Australia picked up on the controversy. It wasn't long before locals were reporting their own "saucer" sightings. There were many reports before 1947 but it was this wide public manifestation and reporting that ushered in the "flying saucer" era which in turn would be recognised and defined as the UFO phenomenon. My web site www.theozfiles.com documents some of the Australian pre 1947 sightings along with a few 1947 reports. An example of the Australian reporting of the period can be seen in this front page of the Sydney afternoon newspaper "The Sun" of July 8 1947 - "39 STATES SEE 'SAUCERS', MYSTERY DEEPENS, FANTASTIC THEORIES, 6 Claim They Saw "Saucers" Over Sydney, "Illusions," Claims Psychologist." Other Sydney newspaper coverage at the time included the following headlines: "First 'Saucer' Found Was A Balloon" (a reference to the Roswell story - The Sun, July 9), "MORE 'FLYING SAUCERS' REPORTED IN U.S." (Daily Mirror July 7), "TWO "FLYING SAUCERS" SEEN TO LAND IN U.S., Searchers Fail To Find Any Traces, Phenomena Seen By Sydney People." (Daily Mirror, July 8), (and in a measure of how quickly the treatment changed) "SAUCERS BEGINNING TO MAKE FOR SHELVES, Back-To-EARTH Flight Route, Festival For the Screwballs." (Daily Mirror, July 9) Inside the Mirror reported "FLYING SAUCER" GROUNDED ON RANCH Handed Over to U.S. Army DETAILS OF DISC KEPT SECRET. SKY GAZERS GOT IT IN THE NECK (this story announced "Sydney people have given up gazing into the heavens after "flying saucers") , The Sydney Daily Telegraph newspaper reported a similar evolution in reporting: "FLYING SAUCERS" REPORTED IN AMERICAN SKIES (July 7), "AMERICAN PLANES PATROL FOR "FLYING SAUCERS" (July 8), "It Was Only A Storm In A Saucer U.S.A. NOW LAUGHS AT DISC "Flights Of Fancy" (July 9), "Flying Saucers" Queer Tales Told By "Observers" (July 9). Sydney's "newspaper of record" - the Sydney Morning Herald chimed in with stories like "Students At Sydney University See "Flying Saucers"; Professor F..S. Cotton's Theory" (July 8) and "Sydney People Still Say They're Seeing "Flying Saucers" (July 9). It was a pretty tough gauntlet that any "saucer" spotter would have to run. The media treatment ensured that the UFO phenomenon's manifestations would remain largely marginalised and somewhat hidden. For Australia at least it would take a rash of sightings in 1950 to give a more substantial public launch for the UFO mystery down under. These included the sightings of Fred Bepps in Geelong Victoria during June 1950 and Alex Holland near Avoca Victoria in July 1950. 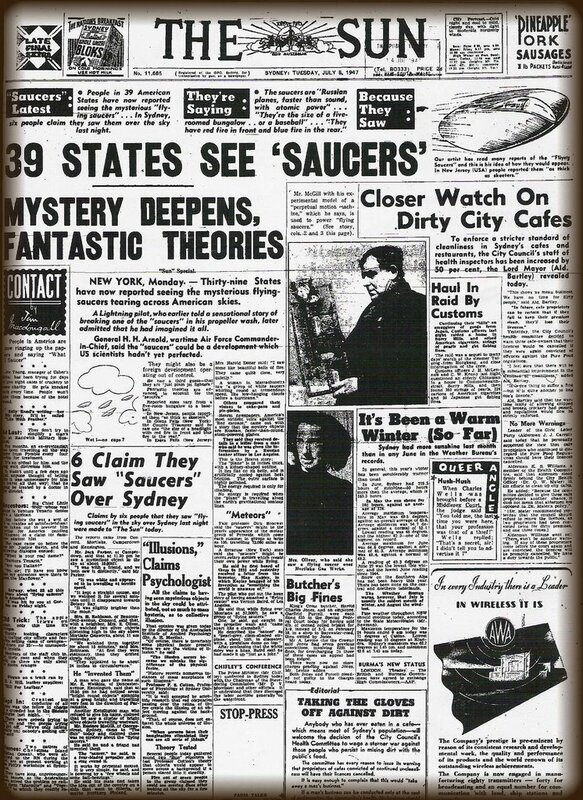 It is ironic that the reporting of a less compelling sighting in New South Wales in April 1950 on the front page of the "Sunday Sun" of April 23 (THEY CALL THESE FLYING SAUCERS Strange sight scares women) may have registered prominently in the consciousness of the "father of Australian ufology" Edgar Jarrold. Inside the same issue Jarrold was "profiled" in the Sun's "People: Human Stories" but not for any UFO or flying saucer angle. That would come with his own sighting in the following year (1951), which led to him to form his Sydney based UFO group - the Australian Flying Saucer Bureau - in July 1952. The Sun's 1950 "profile" described Jarrold as "a man with a secret" - "a book with such a weird plot that it frightens him whenever he thinks about it", a mystery novel called "Death's Darkness". Interviewed at the plaster factory where he worked Jarrold lamented the lot of a struggling writer. He indicated, "I received no encouragement from my parents, who simply bought me expensive accountancy courses which I never finished." The piece is accompaned with a photo of the 31 year old Edgar Ruce Jarrold. A better copy of the photo of Jarrold used in the article was kindly provided to me by his son Karl. The same column reported that E. Stanley Brookes of the Melbourne Society of Psychic and Occult Scientific Research had psychic circle "insights" into the nature of "flying saucers" - "radar-controlled war weapons ... being experimented with by at least two nations". Stanley Brookes, indicated he was also known as "the Graveyard Man" and "the only Australian Red Indian Chief". I think I get his "grave" drift .... lets put it down to the era and a bit of eccentricity. Jarrold's past was rather colourful and interesting. Indeed during World War Two he languished for some time in an internment camp on the Isle of Man for expressing anti-British opinions and becoming a security concern. His internment was probably over extended because of the complication of his use of a false name - Roy Peter Simpson. He was eventually released returning to Australia in August 1943. An extensive security file exists and is accessible via the National Archives of Australia (File Series A367 Item C70388) Keith Basterfield of the Australian Disclosure project kindly provided me with a copy of the file in 2004. Despite the delayed and tentative beginnings the UFO controversy in Australia is an extraordinary manifestation of a global phenomenon with many rich and potent expressions with numerous breakthrough cases and developments emerging from down under. Some of these can be found on my web site (at the link given above) and in my books "The OZ Files - the Australian UFO Story" (1996) and "Hair of the Alien" (2005) (the latter focuses on the alien DNA paradigm strikingly revealed in the DNA study of the biological evidence involved in the Peter Khoury abduction milieu - a case study from Sydney Australia).